The meaningful Hebrew accredited course that provides an excellent opportunity for our teenage students to earn foreign language credits while receiving a meaningful Hebrew education. Is the private study WASC Accredited? Yes! The program is offered through the Hebrew Academy of Huntington Beach, a WASC accredited Blue Ribbon school. Are the Hebrew Courses listed on the UC site? Yes! Our Hebrew Courses Ivrit I, Ivrit II, and Ivrit III are currently listed on the UC website of accredited courses. Will transcripts be sent? Yes! Students enrolled in Hebrew High will receive their official, sealed, transcripts from the Hebrew Academy via US postal service mailed directly to the student’s school. Students can earn up to 10 credits per year. When is the first class? Hebrew High runs from Sept. through June. What are the Hours and location? : School hours are Sundays 9:45am to 1:15pm. at the Chabad House in Rossmoor. Credits: Students who complete the requirements of Los Al Hebrew High will receive up to 10 foreign language credits per year. Our courses are listed on the UC Accredited website. 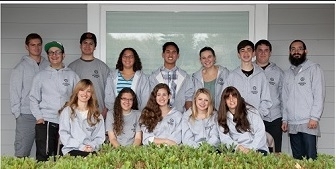 The program is accredited by WASC through the Hebrew Academy in Huntington Beach.